This is the area where the wall and floor meet inside of the basement. Whenever there is a weak seal here, it is only a matter of time before moisture from the soil outside is able to get in and cause damage. Rising and falling water tables caused from droughts and excessive rainfall can put a lot of pressure on this seal, and eventually, it can cause it to break. Some contractors will recommend re-sealing this area to take care of the moisture intrusion. However, at St. Louis Basement Pros, we realize that this is not an effective way to go about taking care of the problem. Sealing this area will only cause the pressure from the earth to build up elsewhere, and this can cause a variety of other problems, including leaning or bowed walls. 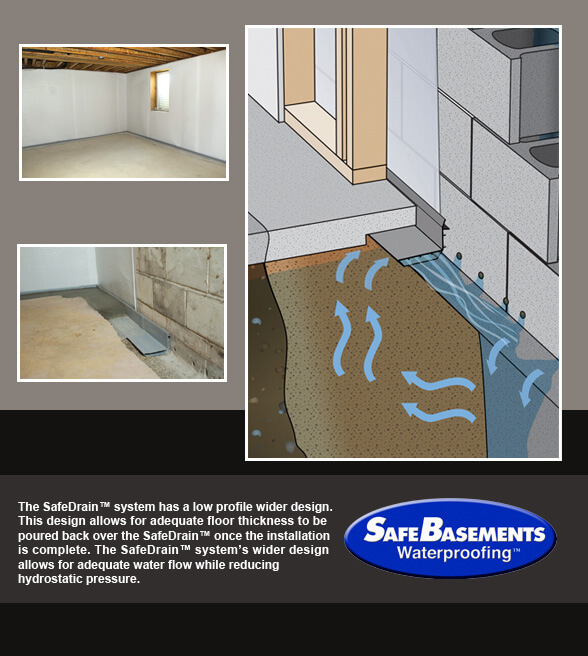 To take care of the problem, we can install an interior drain tile system from SafeBasements™ which will be able to easily collect moisture from this area and direct it into a sump pump where it will eventually be sent out and away from the home.